Most of Russia consists of two plains (the East European Plain and the West Siberian Plain), two lowlands (the North Siberian and the Kolyma, in far northeastern Siberia), two plateaus (the Central Siberian Plateau and the Lena Plateau to its east), and a series of mountainous areas mainly concentrated in the extreme northeast or extending intermittently along the southern border. oil, gas, coal, timber, metals, diamonds, copper, lead, zinc, bauxite, nickel, tin, mercury, gold, silver, platinum, titanium, manganese, potash, uranium, cobalt, molybdenum, tungsten, aluminum, polymetals, chromium, phosphates, apatites, talc, asbestos, mica, salt, amber, prescious, and semiprecious stones, sand, clay, limestone, marble, granite, iron ore, arable land, tobacco, tea, citrus fruit, hydro-elecrity, fresh water, fruits, vegetables, and many more. The geography of Russia describes the geographic features of Russia, a country extending over much of northern Eurasia. Comprising much of eastern Europe and northern Asia, it is the world's largest country in total area. Due to its size, Russia displays both monotony and diversity. As with its topography, its climates, vegetation, and soils span vast distances. From north to south the East European Plain is clad sequentially in tundra, coniferous forest (taiga), mixed and broadleaf forests, grassland (steppe), and semi-desert (fringing the Caspian Sea) as the changes in vegetation reflect the changes in climate. Siberia supports a similar sequence but is predominantly taiga. The country contains forty UNESCO biosphere reserves. Located in the north, west and east latitudes of the Northern Hemisphere, most of Russia is much closer to the North Pole than to the equator. Individual country comparisons are of little value in gauging Russia's enormous size and diversity. The country's 17.09 million square kilometers include one-eighth of the Earth's inhabited land area. Its European portion, which occupies a substantial part of continental Europe, is home to most of Russia's industrial activity and is where, roughly between the Dnieper River and the Ural Mountains, the Russian Empire took shape. Russia includes the entire northern portion of Asia. From west to east, the country stretches from Kaliningrad (the exclave separated by the 1990 Re-Establishment of the State of Lithuania from the then-Soviet Union) to Ratmanov Island (one of the Diomede Islands) in the Bering Strait. This distance spanning about 6,800 kilometres (4,200 mi), to Nome, Alaska. From north to south, the country ranges from the northern tip of the Russian Arctic islands at Franz Josef Land to the southern tip of the Republic of Dagestan on the Caspian Sea, spanning about 4,500 kilometres (2,800 mi) of extremely varied, often inhospitable terrain. Extending for 57,792 kilometres (35,910 mi), the Russian border is the world's longest. Along the 20,139-kilometer land frontier, Russia has boundaries with 14 countries: Norway, Finland, Estonia, Latvia, Lithuania, Poland (via the Kaliningrad Oblast), Belarus, Ukraine, Georgia, Azerbaijan, Kazakhstan, Mongolia, the People's Republic of China and North Korea. Approximately two-thirds of the frontier is bounded by seawater. Virtually all of the lengthy northern coast is well above the Arctic Circle; except for the port of Murmansk—which receives currents that are somewhat warmer than would be expected at that latitude, due to the effects of the Gulf Stream—that coast is locked in ice much of the year. Thirteen seas and parts of two oceans—the Arctic and Pacific—wash Russian shores. Russia shares a maritime boundary with the United States and with Japan. With a few changes of status, most of the Soviet-era administrative and territorial divisions of the Russian Republic were retained in constituting the Russian Federation. As of 2014, there are eighty-five administrative territorial divisions (called federal subjects): twenty-two republics, nine krais (territories), forty-six oblasts (provinces), one autonomous oblast, four autonomous okrugs, and three cities with federal status, namely the cities of Moscow, Saint Petersburg, and Sevastopol. The republics include a wide variety of peoples, including northern Europeans, Tatars, Caucasus peoples, and indigenous Siberians. The largest federal subjects are in Siberia. Located in east-central Siberia, the Sakha Republic (Yakutia) is the largest federal subject in the country (and the largest country subdivision in the world), twice the size of Alaska. Second in size is Krasnoyarsk Krai, located west of Sakha in Siberia. Kaliningrad Oblast, which is a noncontiguous constituent entity of Russia, is the smallest oblast. The Republic of Ingushetia is both the smallest republic and the smallest federal subject of Russia except for the three federal cities. The two most populous federal subjects, Moscow Oblast (with Moscow) and Krasnodar Krai, are in European Russia. As of 2018, Russia has a population of 146.9 million people. Russia is ranked as having the 9th largest population of any country in the world. Russia's capital, Moscow, has 12.166 million people; Saint Petersburg 4.993 million; Novosibirsk 1.497 million; Yekaterinburg 1.379 million; Nizhniy Novgorod 1.212 million; and Samara 1.164 million. List of cities and towns in Russia by population. This makes Moscow the most populated city in Russia. The East European Plain encompasses most of European Russia. The West Siberian Plain, which is the world's largest, extends east from the Urals to the Yenisei River. Because the terrain and vegetation are relatively uniform in each of the natural zones, Russia presents an illusion of uniformity. Nevertheless, Russian territory contains all the major vegetation zones of the world except a tropical rain forest. Map of the Russian Arctic. The Russian Arctic stretches for close to 7,000 kilometres (4,300 mi) west to east, from Karelia and the Kola Peninsula to Nenetsia, the Gulf of Ob, the Taymyr Peninsula and the Chukchi Peninsula (Kolyma, Anadyr River, Cape Dezhnev). Russian islands and archipelagos in the Arctic Sea include Novaya Zemlya, Severnaya Zemlya, and the New Siberian Islands. About 57 percent of Russia is tundra—a treeless, marshy plain. The tundra is Russia's northernmost zone, stretching from the Finnish border in the west to the Bering Strait in the east, then running south along the Pacific coast to the northern Kamchatka Peninsula. The zone is known for its herds of wild reindeer, for so-called white nights (dusk at midnight, dawn shortly thereafter) in summer, and for days of total darkness in winter. The long, harsh winters and lack of sunshine allow only mosses, lichens, and dwarf willows and shrubs to sprout low above the barren permafrost. Although several powerful Siberian rivers traverse this zone as they flow northward to the Arctic Ocean, partial and intermittent thawing hamper drainage of the numerous lakes, ponds, and swamps of the tundra. Frost weathering is the most important physical process here, gradually shaping a landscape that was severely modified by glaciation in the last ice age. Less than one percent of Russia's population lives in this zone. The fishing and port industries of the northwestern Kola Peninsula and the huge oil and gas fields of northwestern Siberia are the largest employers in the tundra. With a population of 180,000, the industrial frontier city of Norilsk is second in population to Murmansk among Russia's settlements above the Arctic Circle. From here you can also see the auroras (northern lights). Taiga the most extensive natural area of Russia - stretches from the western borders of Russia to the Pacific. It occupies the territory of the Eastern Europe and West Siberian plains to the north of 56 ° -58 ° N and most of the territory east of Yenisei River taiga forests reach the southern borders of Russia in Siberia taiga only accounts for over 60% of Russia. In the north-south direction the eastern taiga is divided (east of the Yenisei River), with a continental climate, and west, with a milder climate, in general, the climate zone is moist, moderately warm (cool in the north) in the summer and harsh winter, there is a steady snow cover in the winter. In the latitudinal direction, the taiga is divided into three subzones - northern, middle and southern taiga. In the western taiga dense spruce and fir forests on wetlands alternate with pine forests, shrubs, and meadows on the lighter soils. Such vegetation is typical of the eastern taiga, but it plays an important role not fir and larch. Coniferous forest, however, does not form a continuous array and sparse areas of birch, alder, willow (mainly in river valleys), the wetlands - marshes. Within the taiga are widespread fur-bearing animals - sable, marten, ermine, moose, brown bear, Wolverine, wolf, and muskrat. In the taiga is dominated by podzolic and cryogenic taiga soils, characterized by clearly defined horizontal structure (only in the southern taiga there is sod-podzolic soil). Formed in a leaching regime, poor humus om. Groundwater is normally found in the forest close to the surface, washing calcium from the upper layers, resulting in the top layer of soil of the taiga discolored and oxidized. Few areas of the taiga, suitable for farming, are located mainly in the European part of Russia. Large areas are occupied by sphagnum marshes (here is dominated by podzolic-boggy soil). To enrich the soil for agricultural purposes should be making lime and other fertilizer. Russian Taiga has the world's largest reserves of coniferous wood, but from year to year - as a result of intensive logging - they decrease. Development of hunting, farming (mainly in river valleys). The mixed and deciduous forest belt is triangular, widest along the western border and narrower towards the Ural Mountains. The main trees are Oak and Spruce, but many other growths of vegetation such as ash, aspen, birch, hornbeam, maple, and pine reside there. Separating the taiga from the wooded steppe is a narrow belt of birch and aspen woodland located east of the Urals as far as the Altay Mountains. Much of the forested zone has been cleared for agriculture, especially in European Russia. Wildlife is more scarce as a result of this, but the roe deer, wolf, fox, and squirrel are very common. The steppe has long been depicted as the typical Russian landscape. It is a broad band of treeless, grassy plains, interrupted by mountain ranges, extending from Hungary across Ukraine, southern Russia, and Kazakhstan before ending in Manchuria. Most of the Soviet Union's steppe zone was located in the Ukrainian and Kazakh republics; the much smaller Russian steppe is located mainly between those nations, extending southward between the Black and Caspian Seas before blending into the increasingly desiccated territory of the Republic of Kalmykia. In a country of extremes, the steppe zone provides the most favorable conditions for human settlement and agriculture because of its moderate temperatures and normally adequate levels of sunshine and moisture. Even here, however, agricultural yields are sometimes adversely affected by unpredictable levels of precipitation and occasional catastrophic droughts. The soil is very dry. Russia's mountain ranges are located principally along its continental dip (the Ural Mountains), along the southwestern border (the Caucasus), along the border with Mongolia (the eastern and western Sayan Mountains and the western extremity of the Altay Mountains), and in eastern Siberia (a complex system of ranges in the northeastern corner of the country and forming the spine of the Kamchatka Peninsula, and lesser mountains extending along the Sea of Okhotsk and the Sea of Japan). Russia has nine major mountain ranges. In general, the eastern half of the country is much more mountainous than the western half, the interior of which is dominated by low plains. The traditional dividing line between the east and the west is the Yenisei River valley. In delineating the western edge of the Central Siberian Plateau from the West Siberian Plain, the Yenisey runs from near the Mongolian border northward into the Arctic Ocean west of the Taymyr Peninsula. The Ural Mountains form the natural boundary between Europe and Asia; the range extends about 2,100 kilometres (1,300 mi) from the Arctic Ocean to the northern border of Kazakhstan. Several low passes provide major transportation routes through the Urals eastward from Europe. The highest peak, Mount Narodnaya, is 1,894 metres (6,214 ft). The Urals also contain valuable deposits of minerals. To the east of the Urals is the West Siberian Plain, stretching about 6 kilometers from west to east and about 670 kilometers from north to south. With more than half its territory below 200 meters in elevation, the plain contains some of the world's largest swamps and floodplains. Most of the plain's population lives in the drier section south of 77 north latitude. The region directly east of the West Siberian Plain is the Central Siberian Plateau, which extends eastward from the Yenisei River valley to the Lena River valley. The region is divided into several plateaus, with elevations ranging between 320 and 740 meters; the highest elevation is about 1,800 meters, in the northern Putoran Mountains. The plain is bounded on the south by the Baikal Mountains system and on the north by the North Siberian Lowland, an extension of the West Siberian Plain extending into the Taymyr Peninsula on the Arctic Ocean. In the mountain system west of Lake Baikal in south-central Siberia, the highest elevations are 3,300 meters in the Western Sayan, 3,200 meters in the Eastern Sayan, and 4,500 meters at Belukha Mountain in the Altay Mountains. The Eastern Sayan reach nearly to the southern shore of Lake Baikal; at the lake, there is an elevation difference of more than 4,500 meters between the nearest mountain, 2,840 meters high, and the deepest part of the lake, which is 1,700 meters below sea level. The mountain systems east of Lake Baikal are lower, forming a complex of minor ranges and valleys that reaches from the lake to the Pacific coast. The maximum height of the Stanovoy Range, which runs west to east from northern Lake Baikal to the Sea of Okhotsk, is 2,550 meters. To the south of that range is southeastern Siberia, whose mountains reach 800 meters. Across the Strait of Tartary from that region is Sakhalin Island, Russia's largest island, where the highest elevation is about 1,700 meters. The small Moneron Island, the site of the shootdown of Korean Air Lines Flight 007, is found to its west. Northeastern Siberia, north of the Stanovoy Range, is an extremely mountainous region. The long Kamchatka Peninsula, which juts southward into the Sea of Okhotsk, includes many volcanic peaks, some of which are still active. The highest is the 4,750-meter Klyuchevskaya Sopka, the highest point in the Russian Far East. The volcanic chain continues from the southern tip of Kamchatka southward through the Kuril Islands chain and into Japan. Kamchatka also is one of Russia's two centers of seismic activity (the other is the Caucasus). In 1995, a major earthquake largely destroyed the oil-processing town of Neftegorsk. Also located in this region is the very large Beyenchime-Salaatin crater. A clear view of Lake Baikal captured by SeaWiFS. Crossing of the rivers Chusovaya (tributary) and Kama (main river) near the city of Perm. Ural mountains on the right. Russia is a water-rich country, divided into twenty watershed districts. The earliest settlements in the country sprang up along the rivers, where most of the urban population continues to live. The Volga, Europe's longest river, is by far Russia's most important commercial waterway. Four of the country's thirteen largest cities are located on its banks: Nizhny Novgorod, Samara, Kazan, and Volgograd. The Kama River, which flows west from the southern Urals to join the Volga in the Republic of Tatarstan, is a second key European water system whose banks are densely populated. Russia has thousands of rivers and inland bodies of water, providing it with one of the world's largest surface-water resources. However, most of Russia's rivers and streams belong to the Arctic drainage basin, which lies mainly in Siberia but also includes part of European Russia. Altogether, 84 percent of Russia's surface water is located east of the Urals in rivers flowing through sparsely populated territory and into the Arctic and Pacific oceans. In contrast, areas with the highest concentrations of population, and therefore the highest demand for water supplies, tend to have the warmest climates and highest rates of evaporation. As a result, densely populated areas such as the Don and Kuban River basins north of the Caucasus have barely adequate (or in some cases inadequate) water resources. Forty of Russia's rivers longer than 1,000 kilometers are east of the Urals, including the three major rivers that drain Siberia as they flow northward to the Arctic Ocean: the Irtysh-Ob system (totaling 5,380 kilometers), the Yenisei (4,000 kilometers), and the Lena (3,630 kilometers). The basins of those river systems cover about eight million square kilometers, discharging nearly 50,000 cubic meters of water per second into the Arctic Ocean. The northward flow of these rivers means that source areas thaw before the areas downstream, creating vast swamps such as the 48,000-square-kilometer Vasyugan Swamp in the center of the West Siberian Plain. The same is true of other river systems, including the Pechora and the Northern Dvina in Europe and the Kolyma and the Indigirka in Siberia. Approximately 10 percent of Russian territory is classified as swampland. A number of other rivers drain Siberia from eastern mountain ranges into the Pacific Ocean. The Amur River and its main tributary, the Ussuri, form a long stretch of the winding boundary between Russia and China. The Amur system drains most of southeastern Siberia. Three basins drain European Russia. The Dnieper, which flows mainly through Belarus and Ukraine, has its headwaters in the hills west of Moscow. The 1,860-kilometer |Don originates in the Central Russian Upland south of Moscow and then flows into the Sea of Azov and the Black Sea at Rostov-on-Don. The Volga is the third and by far the largest of the European systems, rising in the Valdai Hills west of Moscow and meandering southeastward for 3,510 kilometers before emptying into the Caspian Sea. Altogether, the Volga system drains about 1.4 million square kilometers. Linked by several canals, European Russia's rivers long have been a vital transportation system; the Volga system still carries two-thirds of Russia's inland water traffic. Russia's inland bodies of water are chiefly a legacy of extensive glaciation. In European Russia, the largest lakes are Ladoga and Onega northeast of Saint Petersburg, Lake Peipus on the Estonian border, and the Rybinsk Reservoir north of Moscow. Smaller man-made reservoirs, 160 to 320 kilometers long, are on the Don, the Kama, and the Volga rivers. Many large reservoirs also have been constructed on the Siberian rivers; the Bratsk Reservoir northwest of Lake Baikal is one of the world's largest. The most prominent of Russia's bodies of fresh water is Lake Baikal, the world's deepest and most capacious freshwater lake. Lake Baikal alone holds 85% of the freshwater resources of the lakes in Russia and 20% of the world's total. It extends 632 kilometers in length and 59 kilometers across at its widest point. Its maximum depth is 1,713 meters. Numerous smaller lakes dot the northern regions of the European and Siberian plains. The largest of these are lakes Belozero, Topozero, Vygozero, and Ilmen in the European northwest and Lake Chany in southwestern Siberia. Tundra landscapes that cover most of the region, where conditions are harsh because of the cold climates and plant life is not very well supported to grow because of the harsh conditions, this has become a problem with agriculture as the unfavorable condition make agriculture more difficult. In the region of European Russia, it is also has the European plains which extend about 2,000 miles. The main export of Russia is grain which is about 6% of the world trade, other products that are exported include fish and oil with 3%, meals with 2%, and meat which accounts for less that 1%. Agriculture has always been important for Russia. Russia's land was worked by its peasant class. Russia has a largely continental climate because of its sheer size and compact configuration. Most of its land is more than 400 kilometers (250 mi) from the sea, and the centre is 3,840 kilometers (2,386 mi) from the sea. In addition, Russia's mountain ranges, predominantly to the south and the east, block moderating temperatures from the Indian and Pacific Oceans, but European Russian and northern Siberia lack such topographic protection from the Arctic and North Atlantic Oceans. Because only small parts of Russia are south of 50° north latitude and more than half of the country is north of 60° north latitude, extensive regions experience six months of snow cover over subsoil that is permanently frozen to depths as far as several hundred meters. The average yearly temperature of nearly all of Siberia is below freezing, and the average for most of European Russia is between 5 and 0 °C (41 and 32 °F). Most of Russia has only two seasons, summer and winter, with very short intervals of moderation between them. Transportation routes, including entire railroad lines, are redirected in winter to traverse rock-solid waterways and lakes. Some areas constitute important exceptions to this description, however: the moderate maritime climate of Kaliningrad Oblast on the Baltic Sea is similar to that of the American Northwest; the Russian Far East, under the influence of the Pacific Ocean, has a monsoonal climate that reverses the direction of wind in summer and winter, sharply differentiating temperatures; and a narrow, subtropical band of territory provides Russia's most popular summer resort area on the Black Sea. In winter, an intense high-pressure system causes winds to blow from the south and the southwest in all but the Pacific region of the Russian landmass; in summer, a low-pressure system brings winds from the north and the northwest to most of the landmass. Russia is the coldest country of the world (average annual temperature is −5.5 °C (22.1 °F)). That meteorological combination reduces the wintertime temperature difference between north and south. Thus, average January temperatures are −6 °C (21 °F) in Saint Petersburg, −27 °C (−17 °F) in the West Siberian Plain, and −43 °C (−45 °F) at Yakutsk (in east-central Siberia, at approximately the same latitude as Saint Petersburg), while the winter average on the Mongolian border, whose latitude is some 10° farther south, is barely warmer. Summer temperatures are more affected by latitude, however; the Arctic islands average 4 °C (39.2 °F), and the southernmost regions average 20 °C (68 °F). Russia's potential for temperature extremes is typified by the national record low of −68 °C (−90 °F), recorded at Verkhoyansk in north-central Siberia and the record high of 45 °C (113.0 °F), recorded at several southern stations (Utta). Because Russia has little exposure to ocean influences, most of the country receives low to moderate amounts of precipitation. The highest precipitation falls in the northwest, with amounts decreasing from northwest to southeast across European Russia. The wettest areas are the small, lush subtropical region adjacent to the Caucasus and along the Pacific coast: Sochi receives 1,500 millimetres (60 in) per year and the Kuril Islands typically around 1,000 to 1,500 millimetres (40 to 60 in) - much of which is snow. Along the Baltic coast, average annual precipitation is 600 millimeters (20 in), and in Moscow it is 525 millimeters (20 in). An average of only 20 millimeters (0.8 in) falls along the Russian–Kazakh border, and as little as 15 millimeters (0.6 in) may fall along Siberia's Arctic coastline. Average annual days of snow cover, a critical factor for agriculture, depends on both latitude and altitude. Cover varies from forty to 200 days in European Russia, and from 120 to 250 days in Siberia. There was some dispute with its neighboring country Belarus as in early 2017 they introduce free-visa and a few months afterwards Russia put border control along the border between the two countries, which has affected Belarus state-run airlines income, Moscow responded back by saying that this measure was being taken so that it could prevent the growing threat of terrorism. Russia's government has an Executive Branch, Legislative Branch, and Judicial Branch. Chief of State has been President Vladimir Putin, since May 7th, 2012. The Legislative Branch is made of the Federation Council, 170 seats, 4 year terms. The Supreme Court of the Russian Federation is made of 170 members divided up into The Judicial Panel for Criminal Affair, The Judicial Panel for Civil Affairs, and The Military Panel. Suffrage is given at the age of 18 and is universal. The recent falling in the Russian economy has turned and its momentum is expected to peak at a modest 3.1% in 2018. Russia has shown further macro-economic security, by continuing its recovery, which has been intensified by non trading sectors. Higher energy prices, which has heightened the trade surplus, has proven to also continue the trend in strengthening the current economy. A Central Bank cleansing, has helped the State controlled banking assets growth, which helped the almost 70%increase with combined assets for the Russian Banking system. With focus on a new digital infrastructure, new socio-economic benefits can only happen with the implementation of newer policies that can sustain and accelerate this transformation. Although the outlook is mostly positive, the paradigm shift from the still recovering economy, forecasts show that this may not fully happen until the year 2020. Russian foreign trade exports are mainly derived from oil and petroleum (gas and coal), steel, metals and minerals. The emphasis in export is mainly focused on the oil and petroleum industry. Other important exports include machinery, equipment, fertilizer, timber, and natural gas. CIS countries heavily rely on the Russian export industry, as it provides most of their needs. Russia imports machinery and equipment, vehicles, consumer goods, foodstuff, chemical products, and industrial consumer goods. Major trading partners with Russia are Germany, Italy, Poland, Switzerland, United Kingdom, United States, and Finland. The Russian Ruble is Russia's money. 1 Russian Ruble = 0.015 United States Dollar. In 2015, it was estimated that about 13.3% of the population lives below the poverty line in Russia. Kaliningrad forms the westernmost part of Russia, having no land connection to the rest of the country. It is bounded by Poland, Lithuania, and the Baltic Sea. Crimea, a peninsula on the Black Sea, is claimed and de facto administered by the Russian Federation since Russia annexed it in March 2014. It is recognized as a territory of Ukraine by most of the international community. Russia holds the greatest reserves of mineral resources than any country in the world. Though they are abundant, they are in remote areas with extreme climates, making them expensive to mine. The country is the most abundant in mineral fuels. It may hold as much as half of the world's coal reserves and even larger reserves of petroleum. Deposits of coal are scattered throughout the region, but the largest are located in central and eastern Siberia. The most developed fields lie in western Siberia, in the northeastern European region, in the area around Moscow, and in the Urals. The major petroleum deposits are located in western Siberia and in the Volga-Urals. Smaller deposits are found throughout the country. Natural gas, a resource of which Russia holds around forty percent of the world's reserves, can be found along Siberia's Arctic coast, in the North Caucasus, and in northwestern Russia. Major iron-ore deposits are located south of Moscow, near the Ukrainian border in the Kursk Magnetic Anomaly; this area contains vast deposits of iron ore that have caused a deviation in the Earth's magnetic field. There are smaller deposits in other parts of the country. The Ural mountains hold small deposits of manganese. Nickel, tungsten, cobalt, molybdenum and other iron alloying elements occur in adequate quantities. Russia also contains most of the nonferrous metals. Aluminium ores are scarce and are found primarily in the Ural region, northwestern European Russia, and south-central Siberia. Copper is more abundant and major reserves are located in the Urals, the Norilsk area near the mouth of the Yenisey in eastern Siberia, and the Kola Peninsula. Another vast deposit located east of Lake Baikal only became exploited when the Baikal-Amur Mainline (BAM) railroad was finished in 1989. The North Caucasus, far eastern Russia, and the western edge of the Kuznetsk Basin in southern Siberia contain an abundance of lead and zinc ores. These are commonly found along with copper, gold, silver, and a large amount of other rare metals. The country has one of the largest gold reserves in the world; mostly in Siberia and the Urals. Mercury deposits can be found in the central and southern Urals and in south-central Siberia. Volcanic activity in the Kuril Islands and volcanoes and earthquakes on the Kamchatka peninsula are other natural hazards. ^ "Russia". Encyclopædia Britannica. Retrieved 2008-01-31. ^ "Russia::Climate and vegetation". Encyclopædia Britannica. Retrieved 2007-07-03. ^ The World Network of Biosphere Reserves — UNESCO. "Russian Federation". Archived from the original on February 22, 2008. Retrieved December 26, 2007. ^ "Russian Federation". data.worldbank.org. Retrieved 2018-09-22. ^ a b c d "The World Factbook — Central Intelligence Agency". www.cia.gov. Retrieved 2018-11-13. ^ "Moscow Population 2018 (Demographics, Maps, Graphs)". worldpopulationreview.com. Retrieved 2018-11-16. ^ "Russia Percent urban population - data, chart | TheGlobalEconomy.com". TheGlobalEconomy.com. Retrieved 2018-11-16. ^ Hays, Jeffrey. "AGRICULTURE AND AGRICULTURE POLICY IN RUSSIA | Facts and Details". factsanddetails.com. Retrieved 2018-10-13. ^ "The World Factbook — Central Intelligence Agency". www.cia.gov. Retrieved 2018-11-01. ^ "In 2017 the export of agricultural products from Russia will exceed $20.5 billion". UkrAgroConsult (in Russian). Retrieved 2018-11-01. ^ "Russia and Agriculture - History Learning Site". History Learning Site. Retrieved 2018-10-16. ^ Shraibman, Artyom. "The Boundaries of Friendship: Russia's Border Dispute with Belarus". Carnegie Moscow Center. Retrieved 2018-11-02. ^ "Russia Economic Report". World Bank. Retrieved 2018-10-29. ^ "Russia Foreign Trade - Export and Import". www.advantour.com. Retrieved 2018-10-16. ^ "World Development Indicators - Google Public Data Explorer". www.google.com. Retrieved 2018-10-29. ^ "russia gdp per capita - Google Search". www.google.com. Retrieved 2018-10-29. ^ "russia gross national income - Google Search". www.google.com. Retrieved 2018-10-29. ^ "russian currency - Google Search". www.google.com. Retrieved 2018-10-31. ^ Georgia and the majority of the world does not recognize the independence of Abkhazia and South Ossetia, considering the Russian border with these countries as part of the Russian–Georgian border. The Geography of the Soviet Union includes the geographic features of countries of the former Union of Soviet Socialist Republics. The Soviet Union was the largest country in the world, covering approximately one-seventh of Earth's land surface. It was two and a half times the size of the United States, and only slightly smaller in land area than the entire continent of North America. It covered most of the northern half of Asia and a large part of Eastern Europe, extending even into the Middle East. About one-quarter of its territory was in Europe, and the rest in Asia. The territory of the USSR was dominated by the Russian Soviet Federative Socialist Republic—having the same borders as contemporary Russia—which covered roughly three-quarters of the surface area of the union. Alkhanay National Park encompasses the area around Mt. Alkhanai, a central focus and sacred mountain to the Buryats people, who today are the largest indigenous group in Siberia. Mt. Alkanai has been adopted as sacred by later Mongols, shamanistic people, and Buddhists. The Dalai Lama has made two unofficial visits to Alkhanay. The area takes its name from an old legend, in which a princess took refuge from her pursuers on the top of the mountain, defiantly shouting as they approached, "kill me! ", which translates to "Alkhanai" in the local language. Despite the ancient name, the focus today of Buddhist pilgrims as they ascend the mountain pathway is one of peacefulness and healing. The park seeks to balance support for continued pilgrimage to the rock landforms and mineral springs, with conservation of nature and recreational tourism. Alkhanay NP is located in the Trans-Baikal region of Russia, about 300 miles east of the lake, and 75 miles north of Mongolia's northern border. It is in the administrative region of Aginsky District, Zabaykalsky Krai. Pribaikalsky National Park covers the southwest coast of Lake Baikal in southeastern Siberia. The coastal strip includes some mountain ridges to the west as well as offshore islands such as Olkhon Island to the east. It is about 50 km southeast of the city of Irkutsk, Irkutsk Oblast. The park is managed with three other nature reserves, and is a major component of the UNESCO World Heritage Site "Lake Baikal". The Angara River, which is the outflow of Lake Baikal west into the Yenisei River basin, runs through the park. The park has very high levels of biodiversity and endemic species. Chikoy National Park was officially created in 2014, on the mountain-steppe border region of south-central Siberia and Mongolia. It is in the Krasnochikoysky District of the Zabaykalsky ("Trans-Baikal") administrative region of Russia. This places the park about 250 miles southeast of Lake Baikal, on the edge of the Lake Baikal ecoregion. The stated purpose for creating the park is the "preservation of unique natural complexes in the upper reaches of the river Chikoy". While tourism and sport fishing will be encouraged, hunting and roads will be prohibited. Baikal-Lena Nature Reserve is a Russian 'zapovednik' located on the northwest coast of Lake Baikal in southern Siberia. It protects both lake shore and the source of the Lena River. The reserve stretches along the western coast of Lake Baikal for about 120 km, with an average width of 65 km. The reserve is situated in the Kachugsky District of Irkutsk Oblast. As of December 1996, the Baikal-Lena Reserve is included in the list of sites of World Cultural and Natural Heritage, and a World Heritage Site with Pribaikalsky National Park. The Baikal-Lena Reserve is managed jointly with Pribaikalsky National Park, which is immediately to the south, thus protecting a continuous 580 km of shoreline on Lake Baikal. Little Sosva Nature Reserve is a Russian 'zapovednik' covering the basin of the Malaya Sosva River, on the east side of the Northern Ural Mountains in the territory of the West Siberian Plain. the Malaya Sosva is a right tributary of the North Sosva River, which flows into the Ob River on its way north to the Kara Sea. Are area of forested wetlands, the reserve protects flat lowlands with a broken relief, a significant incision of river valleys, and a developed river system. 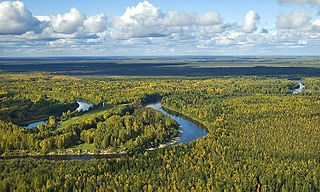 The reserve also protect cultural and architectural sites, including some related to the indigenous Khanty people. The southern two-thirds of the reserve is in the Sovetsky district in the Khanty-Mansi Autonomous District of Khanty-Mansi Autonomous Okrug; the northern sector is in the Beryozovsky District. The reserve was created in 1976, and covers an area of 225,562 ha (870.90 sq mi). Sokhondo Nature Reserve is a Russian 'zapovednik' in the south of Eastern Siberia, 25 km north of the border with Mongolia. It is the farthest source of the Amur River, and is centered on the Sokhondo mountain massif, in the highest sector of the Khentey-Chikoyskogo highlands in the Sokhondo mountain range. Sokhondo has two peaks, and is an ancient volcano. Also within the borders are a large number of lakes of glacial origin. In 1985, Sokhondo was named a UNESCO MAB Biosphere Reserve. The reserve is situated in the Chita district of Chita Oblast. Dzherginsky Nature Reserve is a Russian 'zapovednik', located about 100 km east of the northern section of Lake Baikal. It covers the source and upper reaches of the Barguzin River, the second largest tributary to Lake Baikal, and is at the junction of three mountain ranges - the Barguzin Range to the west of the reserve, the Ikat Range and the South Muya Ridge. The reserve's mountainous territory is dominated by larch forests. It is situated in the Kurumkansky District of Buryatia. The nearest city, Ulan-Ude, is 560 km to the south. The reserve was formally established in 1992 to protect the biodiversity of the upper Barguzin valley, and to study natural processes of the area. It covers an area of 238,088 hectares (919.26 sq mi).